I can picture and hear the crunching. Yuk. 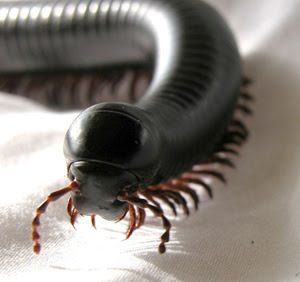 I've held millipedes before. I love how they have smooth, hard, dark shells. On an unrelated note: Have you checked out a book called "The Daring Book for Girls"? A visitor to my blog recommended it to me and it sounds incroyable---right up your alley! hem hem (OH NO!!!! I sound like Umbridge!) 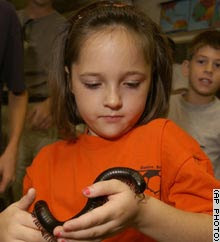 I'd probably be crazy like that girl and hold a millipede. Have you seen this headline yet?
" Scientists find fossil of enormous bug"
It was once an 8-foot scorpion. Gah. I live there and I have no idea how the story made it´s way around the world, it wasn´t that bad at all, just a bunch of small insects.